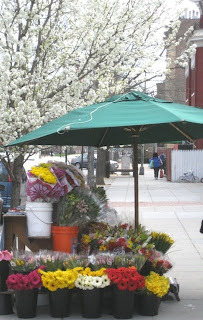 Daughter and I took a walk to the farmers market at Dupont Circle yesterday and found spring busting out all over. There was a canopy of blossoms over the sidewalks. 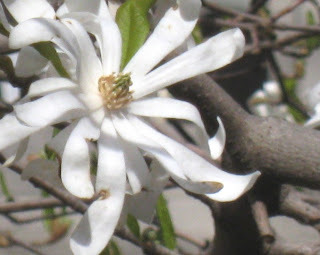 The star magnolias beg you to stop and admire. 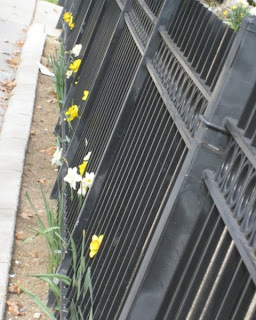 These daffodils were ready to make an escape. 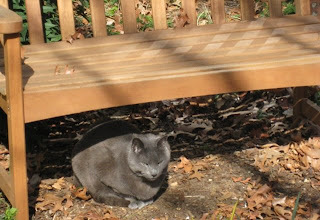 This fellow found a quiet place to sit and to watch the world go by. 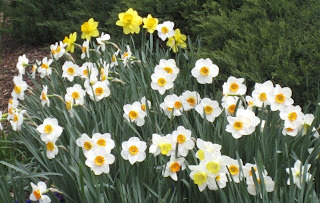 There are places along Rock Creek Parkway where the hillsides are solid daffodils. These made a pleasing arrangement in a yard along our route. 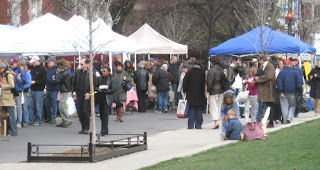 It's been a cooler than usual spring so far in the District of Columbia, but that hasn't kept anyone away from the farmers market. The crocuses have already passed. The tulips have set their buds. 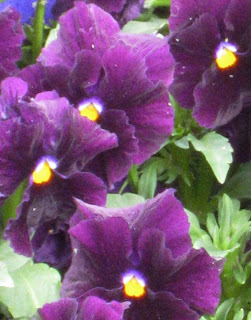 The pansies are a riot of exotic colors. 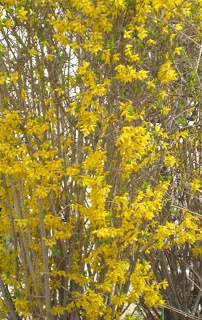 Forsythia comes out in a blaze, then retires for the rest of the year. General Winfield Scott, whose statue stands in the aptly named "Scott Circle," was known as "Old Fuss and Feathers" and served as a general longer than any man in U.S. history. This is looking south down 16th Street toward the White House. Did you know that the 582,000 inhabitants of the District of Columbia (more than the state of Wyoming and almost as many as Vermont and North Dakota)--although we are required to pay taxes like other Americans--have no voting representation in Congress? Isn't that why we fought a revolution? Our license plate reads, "Taxation Without Representation." 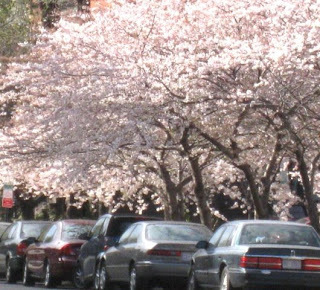 But folks from the rest of the country still love to visit this time of year when the cherry blossoms are in bloom. Locally-grown foods may have a chance to compete with the industrial food complex when there is some infrastructure for local produce. Is that any way to do business? So we were heartened by this story of an indoor (yes, that's right--indoor) farmers market opening in Fairfield, Connecticut. Demand for local farm produce has been so great during the regular season that room was made in a warehouse attached to the Fairfield Theater Company. When a reporter from the New York Times visited recently, the indoor market was bustling. 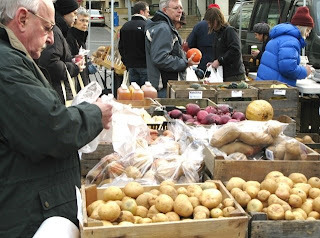 There was only one problem: apparently nobody warned the local farmers that a winter market was in the works, so there was a shortage of produce. It is possible to grow vegetables during the winter in greenhouses or under plastic, even in New England, and farmers say there are some distinct advantages to being able to take their goods directly to a centralized local market. And maybe just a wee bit more pleasant for shoppers as well. Okay, that's fine for people in Fairfield, CT. But what about the other half? An Iowa City, Iowa, group that distributes farm produce to the needy recently came up with a list of the top 10 barriers that prevent low-income families from accessing locally-grown produce. Top of the list is price. "The cost of vegetables and fruit rose 120% between 1985 and 2000," notes the Local Foods Connection, "while the price of junk like sodas and sweets went up less than 50% on average." Fresh food typically doesn't provide as many calories as cheap, processed food and very often lower income families just don't have the habit, the know-how or the kitchen equipment to deal with fresh produce. Also high on the list of roadblocks for the poor: They don't have the means of getting to where local produce is being sold. Again, it's that pesky issue of infrastructure. Many of the nation's poor live in "food desserts," areas where the only nearby source of food is the corner convenience store. Could this be a reason why sales of local produce still represent just a tiny fraction of the food consumed in this country? Meanwhile, as we wring our hands over local food issues, some heavy footsteps can be heard rumbling in the background. That would be the sound of the industrial food complex and all its corporate foot soldiers marching in the opposite direction. Want to know where they're going? Here's a clue: follow the money. For instance, remember all that talk in Congress about cutting back farm subsidies? Well, it looks like Big Ag has put out that brush fire. "U.S. farm income, buoyed by demand for grain from rising middle classes around the globe and the biofuels industry, is projected to reach a record $92.3 billion this year," reports the Wall Street Journal. "Still, farmers are expected to collect $13 billion in federal subsidies this year, according to the U.S. Agriculture Department, including payments for commodities, land conservation and emergency assistance." The agriculture lobby poured $80 million into the fray. "We got rolled," says Rep. Paul Ryan, a Wisconsin Republican who was among those trying to trim the subsidy program. "The agriculture community circled the wagons." Farmers make up less than 1% of the U.S. population, and agriculture production is dominated by large, industrial farms that have annual sales of $1 million or more, the Journal reports. In 2006, average farm household income was $77,654, or about 17% more than average U.S. household income, according to the Department of Agriculture. Average farm household income is expected to be about $90,000 this year. Current law allows subsidies to farmers with annual adjusted gross income of as much as $2.5 million. "If you're providing benefits to the wealthiest Americans, that's not a safety net," said Chuck Connor, deputy agriculture secretary and the Bush administration's lead farm-bill negotiator. "We felt that was fundamentally wrong." But in the end, it came down to politics as usual. Meanwhile, worldwide demand for more and better food, along with government-induced efforts to turn food crops into fuel for automobiles, is pushing the cost of farmland through the roof. In southwestern Iowa, land prices have rocketed 14 percent just in the last six months, with prime crop acreage going for $5,630 an acre. Top among factors cited for the increases are the soaring prices for commodity crops such as corn, soybeans and wheat. Corn prices recently reached $5.52 a bushel, up from about $2.20 in 2006. Iowa is ground zero for industrial ethanol production. Land prices in neighboring Nebraska have risen even higher--23 percent--the sharpest increase ever measured in the 30 years the University of Nebraska has been conducting its survey. That continues a five-year trend that has made the cost of farmland in Nebraska 88 percent higher than it was in 2003. You may be thinking, That's all fine and good for farmers with land to sell. But what could this possibly have to do with global warming? Well, it turns out there is a connection. Part of the funding in the U.S. farm bill pays farmers to hold acreage out of production for conservation purposes. But with commodity prices reaching the stratosphere, and that same government priming the pump for ethanol production, farmers are finding they can make more off the land than what those conservation grants are paying. The USA's open plains and prairies are threatened by soaring grain prices that have increased their value as cropland. Grain prices have been driven up by a seemingly insatiable worldwide appetite for food and by federal energy policies promoting corn-based ethanol that are working at cross purposes with government programs designed to conserve open spaces. As a result, landowners in South Dakota and across the USA's Farm Belt are converting to cropland marginally productive acres that for decades — in some cases, centuries — have remained uncultivated because farming them wouldn't have been profitable or because of their environmental value. . .
. . .Long-term benefits are being overtaken by short-term incentives, however. Farmers chasing near-record prices are coaxing higher yields from current acres and putting more land into crops. Kevin Baloun, a farmer-rancher near Highmore, S.D., is among them. He's plowed up several pieces of virgin prairie in recent years to plant crops. Land values in his area have tripled in the past five years, which makes it harder for farmers to expand production by buying more cropland. "The bottom line is what makes you go that direction," Baloun says of his conversion of prairie to cropland. "Wheat was $4 or $5 a bushel a couple of years ago, and now it's up to $10 or $12 a bushel." Conservationists warn that the current commodity and ethanol frenzy could undo years of hard work and undercut the investment of taxpayer money that has bankrolled federal land- and water-protection programs. "A generation of conservation accomplishments could be rolled back" if commodity prices remain near historic highs, warns Ken Cook, head of the non-profit Environmental Working Group. So the rich are crowding the farmers markets, the not so rich are still buying their Snackables at Wal-Mart and the farmers are making out like bandits with help from the political clusterf*#ck in Washington. Is there anything really wrong with this picture? You may be mildly concerned if you are commuting 60 miles each day in a Cadillac Escalade to your job as a mortgage broker. For the rest of the world, rising food prices constitute a crisis. The United Nations recently sent out an appeal for $500 million to forestall rationing its food assistance to the world's most needy. The agency's funding gap is now about $600m-$700m, officials said, after a 20 per cent jump in food costs in the past three weeks, the rise in the oil price to about $100 a barrel and a surge in shipping costs. The U.S. is the biggest contributor, having donated about $1.1 billion last year, mostly in food shipments. The European Union, with $250 million, and Canada, with $160 million, are the second- and third-largest donors mostly in cash donations. Rice prices jumped 30 per cent to a record high this week, raising fears of fresh outbreaks of social unrest across Asia, where the grain is a staple food for more than 2.5 billion people. The increase came after Egypt, a leading exporter, imposed a formal ban on selling rice abroad to keep local prices down and the Philippines announced plans for a major purchase of the grain in the international market to boost supplies. Global rice stocks are at their lowest since 1976. While prices of wheat, corn and other agricultural commodities have surged since late 2006, the rice prices increase started in January. Philippines, the world's largest importer of rice, is at the point of tapping into emergency stockpiles or imposing rice rationing. Think potatoes. Lots and lots of potatoes. Turns out the lowly pratie produces more calories on less land that any of the usual grain crops. Some think it could be the food of the future. The U.N. opened a conference in Cusco, Peru, with 90 of the world's top potato experts to investigate. "Potato consumption is expanding strongly in developing countries, which now account for more than half of the global harvest and where the potato’s ease of cultivation and high energy content have made it a valuable cash crop for millions of farmers," says the U.N.'s Food and Agriculture Organization. Our friend Mary is visiting from California. Quick! Make a snack! I can say in all honesty that I had nothing to do with this. It's my wife's concoction and her go-to, fattiest, most indulgent and politically incorrect guilt food: Rotel mixed with Velveeta cheese. 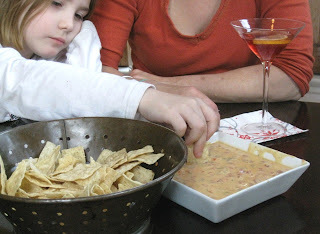 Rotel is like salsa in a can--diced tomatoes and green chilies. Velveeta, as we all know, is a squared-off log of something that looks like cheese but really is made in a laboratory by Kraft. It contains "cheese culture" and "milk protein concentrate," and other things like "sodium alginate." Faux dairy though it may be, Velveeta has great melting properties. 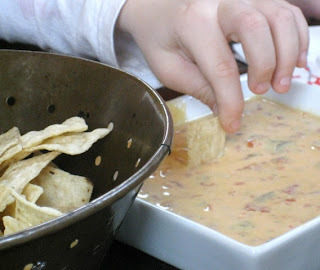 Just dump a few chunks with Rotel in a saucepan and very shortly you have something you can scoop up with tortilla chips. The only problem is, you have to wear a paper bag over your head while you eat it. But my wife wants everyone to know, She doesn't care what you think! Do you have a favorite eating habit that plunges you into the depths of shame and self-loathing? Let us hear about it! 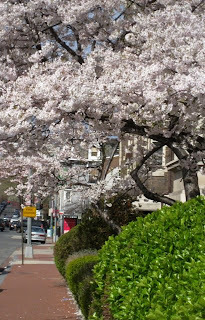 If it's spring, the cherry blossoms must be in bloom here in the District of Columbia. My wife has been busy inventing cookies to mark the occasion. 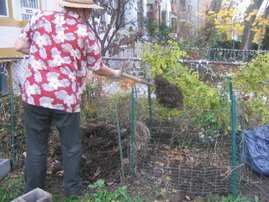 My home is ground zero for our local gardening group, D.C. Urban Gardeners. This is no garden club, but an insurgent conclave committed to greening the District of Columbia. To entice their attendance at these monthly planning sessions, I lay out some kind of buffet. It gives me a chance to show off the food that comes out of our own urban food garden, about one mile from the White House. This menu started with sweet potatoes that arrived in last week's CSA box. I added a mix of cooked greens from the CSA and the garden plus some Gorgonzola cheese to make the sweet potato galette I wrote about some weeks back. Also on the buffet were bowls of our pickled beets and pickled green tomatoes. The green tomatoes are always a sensation. In addition, we still have a surfeit of tomato jam. 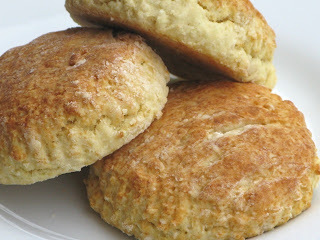 For that I baked some tall, fluffy buttermilk biscuits. Finally, to calm the sweet toothes in the crowd, daughter and I made a batch of heart-shaped brownies. 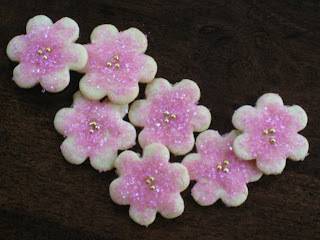 We displayed them on a lacy, white ceramic stand, dusted with confectioner's sugar. We then continued with our insurrection. No matter how much we hover over our garden, Mother Nature will take her course in her own good time. The Roma tomatoes were the first to emerge from the seed tray we've been tending on a heated mat. All four seeds sprouted seemingly in unison. But that just raises the suspense level for our other plantings. We have not seen any activity from our Cherokee Purple tomatoes, for instance, but there are signs of life from Dr. Carolyn, Mortgage Lifter and Green Zebra. 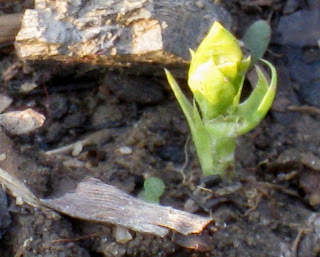 The emerging seedlings are called cotyledons. Plants with two of these "false leaves" are called dicots. Grasses have only one leaf; they're called monocots. These leaves just provide initial nourishment for the tiny plants. The true leaves--the ones that perform photosynthesis--will come later. At that point, these seedlings will need to be placed in a sunny spot to thrive. 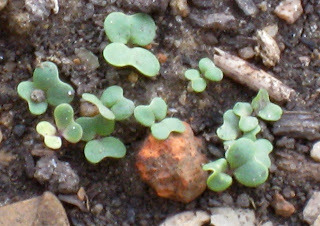 Spinach looks a lot like grass when it first sprouts. 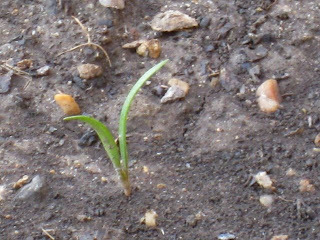 Planted on March 7, it was the first seed to germinate in the garden, even when temperatures overnight were dipping into the 30s. Talk about suspense. I have been checking daily for some movement in our bed of fava beans, first planted back on March 4. Favas are supposed to germinate in seven to 14 days, and here we are three weeks later. I had all but given up hope. 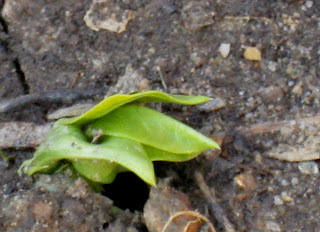 But lo and behold, this morning the favas are beginning to emerge. They like the cold. And a good thing, because this has been a below-average March, temperature-wise. 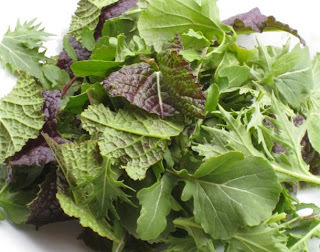 Lettuces, arugula, mustard greens--I like to plant these directly in the garden, sprinkling the seeds over the soil then rubbing them under the surface with the palm of my hand. Distribution of the seeds is never perfectly even, but the plants don't seem to mind terribly. 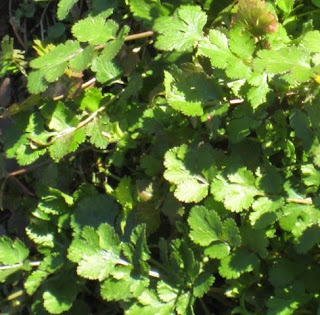 By planting them relatively thickly, they crowd out weeds--most of the time. Here are some little bitty Golden Frill mustard plants. They first become visible as tiny green dots as we water the bed. The telephoto lens makes them look much bigger--a tiny pebble turns into a boulder. Here is one of our first peas of the season. It looks like something from outer space, illuminated by the first light of morning. The peas were also planted March 4, same day as the fava beans, so we have been in a state of high anticipation over them. They have their own schedule, regardless of what it says on the seed packet. Apparently I've gained a reputation as the soup guy in our family. As we were preparing to decamp from Easter dinner and as parting gifts were being distributed, brother-in-law Barry produced the bone from the buffet ham. With a certain glint in his eye, Barry looked in my direction. Would I consider accepting this prize? Have I ever said no to a ham bone? Normally the cured remains of the pork joint would sit a while in our refrigerator while I considered my options. But I had recently been digging through our pantry and discovered a huge bag of French lentils. It came tumbling out of a basket of spices I keep in there (one of my many failings is my lack of organiztion in the spice department--they've outgrown their shelf in the spice cabinet). I decided to make this an all-lentil soup. To accompany the Puy lentils I opened a bag of Indian dal, or yellow lentils. I knew that if these particular legumes remained true to form, the yellow dal would dissolve into the soup and become background for the French lentils, which always seem to retain their shape and some texture no matter how long you cook them. Into the pot went a large yellow onion, diced small, with about 3 tablespoons extra-virgin olive oil and 1 teaspoon coarse salt. Next add three medium carrots, peeled and diced small. Cook the vegetables until the onions begin to soften, about 8 minutes. 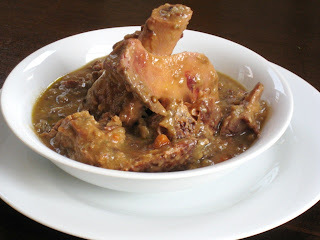 Nestle the ham bone down in the vegetables and add 1 cup each of the Puy and yellow lentils. (In fact, I did not measure, but I believe these are the correct quantities.) Toss in 3 or 4 sprigs fresh thyme and 2 bay leaves, then pour in enough water to cover the ham bone, about 8 cups. Bring the pot to a boil, then reduce heat and simmer for about 4 hours, or until the meat is falling off the ham bone. We ate a bowl for dinner last night and the soup was just thin enough to please my wife. She prefers her legume soups on the thin side, as opposed to library paste. You can jazz this soup up a bit, if you like, by garnishing it with a drizzle of balsamic vinegar. This soup also makes an excellent breakfast. But something happens to these sorts of soups when you leave them out overnight. They become thicker. Even after reheating, the soup had more of a stew-like consistency than the night before. I don't know if there is somehting about the starches in the legumes that thickens it in the night. But if it becomes too thick for your taste, just add a little water. 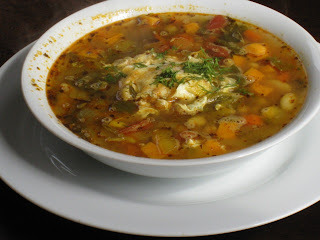 I know this soup will sound very familiar to some readers who may remember me making a pantry soup not long ago with lentils, split peas and a ham bone. To that I can only say that Gertrude Stein had it about right: things improve with repetition. Make this soup and I am betting you will feel as I do that it is far and away better than the one you made the last time. 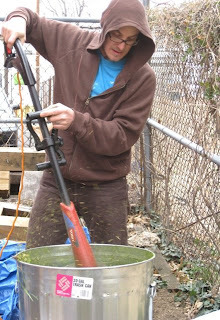 Here's our friend Matt shredding grass and leaves in a trash can to make compost. For you suburbanites out there this may be totally unnecessary: You have a big back yard in which to construct your composting system. But for us city folk, ingenious steps must be devised to compost in small spaces, especially to keep our kitchen scraps away from the local rats. Garbage cans are a bit smaller than what the composting experts describe as the minimum size for an "optimum" compost pile. That would be three feet wide, three feet deep and three feet tall. But in fact compost will happen anywhere, even in a crack in the sidewalk. You can bag leaves in the fall and come back in a couple of years and even those bagged leaves will be turning into compost, the ideal amendment for our organic vegetable beds. 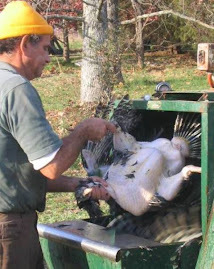 When a neighborhood learning center near my home--the Emergence Community Arts Collective--asked me to teach a course in composting that would result in actual compost, I proposed the trash can method. Teachers at one of the local schools employ several trash cans to turn their garden debris into compost. There's plenty written about it on the internet. I had the arts collective procure a metal trash can (tougher for the rats to get into--I hear they are often available on Craig's List). I came by and drilled a series of drainage holes in the bottom, then more holes around the sides of the can for aeration. After watching my Power Point presentation on the hows and whys of composting, a small group of eager composters went to work in the yard, filling bags with last year's leaves and pulling as much green grass as we could find. 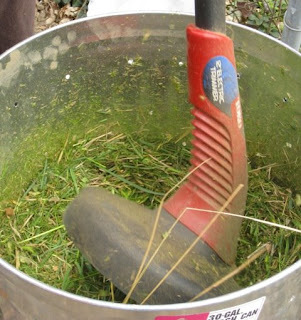 A good compost requires a proper balance of "green" materials, such as grass clippings, and "brown" materials, such as fallen leaves. They aren't always available exactly when you want them. Sometimes it pays to store leaves over the winter for a time when enough grass clippings become available to create the right mix. But if you poke around the neighborhood, you often will find old leaves waiting to be collected in an alley or blown into a pile against a fence. Kitchen scraps and coffee grounds from the local barista also make for good compost. Composting is a good way to recycle your newspaper or shredded personal documents as well. The students were amazed to see how the bags of leaves they colle cted reduced to very little when we shredded them with our electric weed whacker in the trash can. We used the line trimmer just like a hand-held blender, plunging it into the leaves and moving it this way and that. We collected more leaves. And more leaves. And more leaves. And since we didn't have a mower, we collected the grass by hand and shredded that as well. When it was all done, our trash can was a little more than half full, about equal parts chopped leaves and grass for a quick-acting compost. One of the students had brought some shredded paper, another had a bag of kitchen scraps. We mixed that in as well, then added a couple of large pitchers of water until our mix was just damp, about the wetness of a wrung-out sponge. "By tomorrow, this compost will be hot," I assured the class. I knew that bacteria quickly would begin to feast on the nitrogen in the grass clippings, multiplying like crazy and raising the temperature of the heap. My students looked dubious. But this morning I visited the site. The ambient temperature is 40 degrees--just eight degrees above freezing--but inside the trash can, things are already toasty. Looks like it will be at least another year before we see any raw milk for sale in Maryland. Supporters of the bill argued that prohibition of raw milk In Maryland merely forces consumers to travel to nearby Pennsylvania, where raw milk sales are legal, and denies Maryland dairy farmers access to the lucrative raw milk market. About two thirds of all states permit some form of raw milk sales at farms, while another eight states allow raw milk to be sold in retail stores. This past week was not so much a slow news week for food as more of the same. The wild salmon were still MIA in California and Oregon, where the salmon fishery has been closed for the first time ever. Turning corn and other food crops into fuel for automobiles was a more boneheaded idea than ever. And consumers around the globe were in a state of growing apprehension over the rising costs of all kinds of comestibles. With gasoline prices now headed toward $4 a gallon here in the U.S. (I know, seems like a bargain to our British friends), more and more people are thinking those drives to the farmers market in the ol' Land Rover might not be such a great idea. There's increasing talk of Victory Gardens and ditching the front lawn in favor of growing food closer to home. The New York Times devoted an entire design column to ways that architects and designers are incorporating fruit and vegetables into modern living and business arrangements. If you happen to be in the mood to muck about in the soil and grow your own, this has just come in from Mother Earth News: an on-line seed searching tool. I received an e-mail from the magazine asking me to take a look and possibly write a review. "The free Finder searches more than 150 garden catalogs – from the big names to small, specialized companies. Our initial emphasis is on sources for vegetables, but we plan to add fruit and nut tree and ornamental catalogs in the near future," the magazine declares. Type in the name of the seed or plant your looking for, hit the "search" button and Google immediately produces a list of sources. I tried it out a few times, starting with sweet potatoes. I need to put in an order for seedlings, and not everybody sells sweet potato seedlings. This feature eliminates a lot of the extraneous material you'd normally get with a general search, such as bulletins for university extension services, blog posts and recipe recommendations. It takes you right to the seeds. This is great for harder-to-find varieties, but what we really need is a service that points us to seed sources close to home that have more or less everything we need so we can cut down on shipping seeds and plants across the country. and avoid all those handling charges. 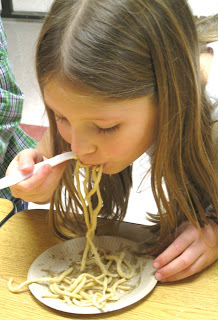 We had so much fun making pasta on the ghitarra at school that I decided to try it at home. Daughter was happy to help. 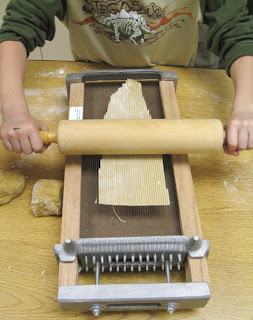 We took turns rolling the dough through the pasta machine, then pressing it through the ghitarra. We keep a big Ziploc bag of pesto cubes in the freezer that we don't use nearly enough. At the end of the summer season we harvest all of our basil (usually much more than we really need) and turn it into pesto sauce with plenty of garlic and pine nuts. Then we freeze the pesto in ice cube trays for storage. My pasta recipe--half all-purpose flour and half whole wheat, and three eggs from our farmer friend Brett--makes at least twice as many noodles as we can possibly eat in one sitting. So when our friend Shelley called to check about Easter plans we immediately invited her and husband John for a casual, impromptu dinner. The pasta pot was ready to boil when they arrived. As cocktails were winding down, I dropped the noodles in the salted water to cook for just a few minutes, then tossed them in a bowl with about four cubes of defrosted pesto and a little of the cooking water. Our CSA box arrived on Thursday with a bag of salad mix. It was a perfect way to finish our simple meal, but I had to add something besides my own vinaigrette. 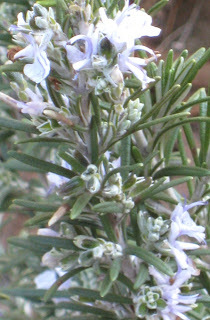 The answer was shouting at me from the herb garden: rosemary blossoms. One of our rosemary plants is in a riot of bloom at the moment. We've never seen anything quite like it--hundreds of tiny, bluish blossoms that on close inspection are quite intricate in their architecture. I gathered a few dozen and sprinkled them over our salad. They do have a faintly rosemary flavor, something to nudge us gently into the new season. Our recent beet harvest yielded about seven pounds, but since these beets were first planted last August I was anxious to see if they were actually edible. The beet greens, braised with garlic, shallots and red wine, yielded a delicious lunch earlier in the week. I cooked the beets yesterday in batches in a large pot of water, leaving the root and some of the stem intact. From the boiling water they went directly into a cold water bath. The skins slipped off easily. I cut the beets into wedges. Now to taste. The verdict? Not bad. A wee bit chewier than you would normally hope, but sweet and quite edible, especially for beets that had been in the ground for seven months. We are learning lots lately about how things overwinter in our kitchen garden here in the District of Columbia. We decided these beets would be good candidates for pickling, but I put a few aside for dinner. I made quick pickles of some red onions. (See below). I tossed the beets and pickled onions with overwintered arugula from the garden and some blue goat's milk cheese, then dressed everything with a simple honey-mustard vinaigrette. 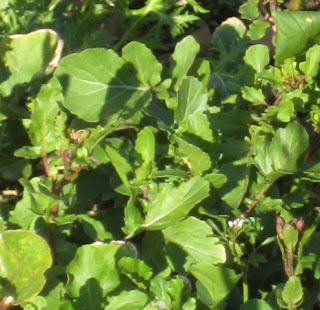 Now that spring is here, the arugula is desperate to go to seed. The seed stems seem to rise overnight. But that's fine with us. Along with the peppery leaves, the buds and flowers are great for spicing up a salad. To pickle a batch of red onions, peel and cut two red onions in half lengthwise, then slice the halves into thin crescents. Put these in a bowl and cover with four cups of boiling water. Let stand 5 to 10 minutes, then drain in a colander. In the same bowl, mix together a marinade of 1/2 cup cider vinegar, 1/2 cup water, two tablespoons honey, 1 teaspoon black peppercorns and 1 teaspoon whole cloves. Return the onions to the bowl, mix and let stand for about 4 hours, tossing the onions in the marinade occasionally. The onions are best chilled before using. Or pack them into 2 pint-sized canning jars with the marinade and store in the refrigerator. Chitarra not only means "guitar" in Italian but also refers to this ancient device for making pasta. It looks like the guts from a piano with thin wires strung from one end to the other. But instead of making music it turns a sheet of pasta into delectable, chewy noodles. Lay the raw pasta dough over the wires and then press, perhaps with a rolling pin. When the dough can be pressed no further--when the wires become perfectly visible through the noodle and the pasta seems to be suspended in mid-air--you strum your fingers across the wires and the noodles fall gently into a tray at the bottom of the Chitarra. They look like squared-off spaghetti. I bought my chitarra about a year ago and have been saving it for just the right moment. Kids love working with kitchen tools. 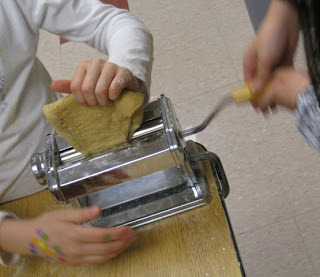 So this lesson was a double treat, because they also got to process the pasta dough in my manual pasta machine. Eventually the class divided into teams, with one side rolling the dough into sheets, the other pressing it through the chitarra. Then they switche d so everyone could have a turn on both devices. Having a hand in the process made the finished pasta all the more delicious. We dressed it very simply, tossing the cooked noodles in garlic and extra-virgin olive oil, then dusting with Parmesan cheese. To make enough pasta alla chitarra for six persons, first put a big pot of heavily salted water on the stove to boil. Add enough salt so that the water tastes like it came from the sea. Next, peel and finely chop four cloves of garlic and drop them into a heavy skillet with 1/2 cup extra-virgin olive oil. Cook the garlic over low heat until it is golden brown but not burned. Using a fork, begin to stir the flour into the liquid around the inside edges of the well, gradually incorporating more and more of the flour into the liquid. When the dry and liquid ingredients have been roughly mixed, start pushing them into a ball with your hands. (If the ball is too sticky, add a little more all-purpose flour.) Knead the dough for a minute or two, then divide it into three approximately equal parts. If some dough sticks to the work surface, scrape it up using a pastry scraper or a spatula. Continue kneading each piece of dough separately by pressing it through the pasta machine at the lowest setting numerous times, folding the dough over onto itself after it comes out of the machine, then rolling it again. Continue until the dough is soft and somewhat elastic. Now roll the dough through the machine at settings two, three and four. Your original dough will become a sheet of pasta--progressively longer and thinner as the settings increase and the machine's rollers narrow--until it has the thickness of conventional spaghetti. Dust the sheet of dough with flour and cut it into two pieces. 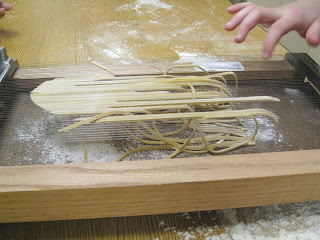 To make the finished noodles, lay one piece of dough lengthwise over the strings of the chitarra. Work a rolling pin over the dough, pressing firmly back and forth until the wires have cut completely through to the surface of the dough. Now strum the end of your thumb across the wires as you would a musical instrument until all of the noodles have fallen into the tray at the bottom of the device. Remove the noodles, place on a plate or baking sheet and dust with flour to prevent sticking. Repeat this process until all three of the original pieces of pasta dough have been turned into noodles. To cook the noodles, I brought my aluminum pasta pot, which has a drop-in strainer. When the water is boiling, drop in the noodles. They won't take very long to cook--much less time than dry, store-bought noodles--so taste after a minute or two. Strain the noodles but do not rinse (the starch on the noodles helps the sauce to adhere). Now toss with the olive oil and garlic, either in your skillet or in a separate bowl. 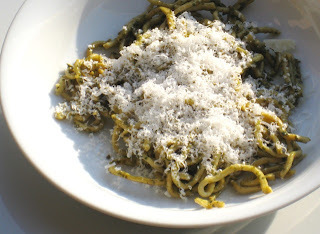 Divide the noodles onto plates and dust liberally with grated Parmesan cheese. Trust me, you will not have to worry about leftovers. Note: In the event you do not have a chitarra, you can make noodles by rolling your sheets of pasta into logs and cutting with a sharp knife. Just make sure the pasta sheets are thoroughly dusted with flour to prevent sticking. We have an abundance of local, farm-fresh eggs from our CSA box. I can't think of a better use than in the soup we made with our farmer friend Brett's sweet potatoes. Call me a freak, but I love finding liquid yolk in my soup spoon. It adds a velvety touch to the broth. from the fridge (there are garbanzo beans in the original soup). They say planting potatoes in our corner of the universe should take place around St. Patrick's day. I was one day off, but very pleased to have potatoes in the ground. 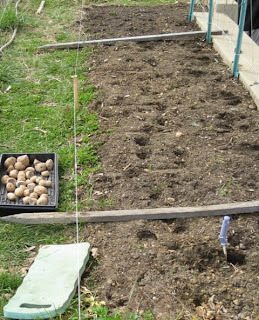 Potatoes are easy to grow and being able to gather them outside your door is one of the greatest benefits of gardening. We were still digging up potatoes through most of the winter. They stored in the ground. Root crops thrive in a loose soil and potatoes are heavy feeders, so I'm giving them the best I've got, a strip of vegetable bed that was filled in with great soil behind a retaining wall. I tried something a little different this year to spur growth: I spread my potato sets in seed trays and left them out in the sun for several days. The potatoes began to shrivel, but soon enough new shoots began to emerge from the "eyes." Potatoes don't plant from seed but rather from other potatoes. Our farmer friend Mike Klein recently delivered four varieties. Look for a "set" with at least three "eyes." 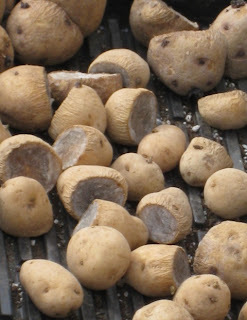 The larger spuds can usually be cut in half or into pieces, which just means more potato plants. My method for planting is to make a small hole with a trowel and place the set with the cut side down, to a depth of about two inches below the surface. I space the sets 15 inches apart, planting them in offset rows in a diamond pattern. Potatoes a ren't really roots but a form of stem growth. They will grow up along the plant stem if the plant is covered. Once these plants are tall enough, I will mound soil around them to encourage the growth of additional spuds. 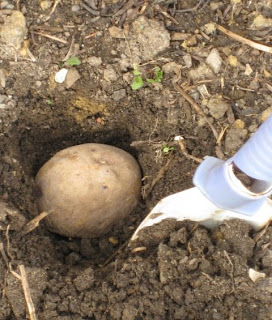 Another fascinating way to grow potatoes is inside an automobile tire, stacking the tires higher and higher as the plants grow and adding more soil as the stack gets taller. As you cover most of the plant with soil, it simply grows taller, producing more leaves. You can even start a system like this over bare concrete. A stack of used tires painted bright colors and producing lots of potatoes is a great idea for a school garden. In other words, there is no excuse for not growing your own praties. We don't make beet greens often because there just aren't enough of them on the typical bunch of beets you buy in the store or at the farmers market. But this morning I cleared out a whole bed of beets that had been planted last August. (Yes, you heard right--last August.) My haul was quite a load of big, healthy beets, as well as a bin full of greens. I separated the greens from the beets, then filled the kitchen sink with cold water, where the greens got a good soak and a wash. While the greens refreshed, I sorted through them, saving the majority (with stems) and tossing the wilted and damaged ones into the compost container. I had an idea to braise these greens and literally was casting about the kitchen, looking for things to add to the pot. There were some garlic cloves, some shallots, a partial bottle of red wine and an orange sitting on the countertop. That all sounded good to me, so I fired up my big cast-iron skillet. In the end, I had about 1 1/2 gallons of greens, so this formula is for a big mess of beet greens. Adjust according to the quantity you have on hand. In a large skillet, heat a tablespoon or two of extra-virgin olive oil and saute over low heat 3 shallots, peeled and cut into thin rings, and 3 cloves garlic, smashed and roughly chopped. When the shallot begins to soften, start adding the cleaned beet greens. They will be dripping water, which is fine for the braising. After filling the skillet with a 1-inch layer, drizzle some olive oil over the greens and season with a pinch of coarse salt. Turn up the heat to moderate and continue layering the beet greens with olive oil and salt until they are all in the skillet. It will make quite a mound, but will soon cook down. As the greens cooks, turn them occasionally with your spring-loaded tongs and lower the heat so they just simmer. When the water has evaporated, after about 15 minutes, pour about 1/3 cup red wine over the greens and continue braising. If the skillet runs dry before the greens are perfectly tender, add some more wine. Season with black pepper. Meanwhile, section two oranges over a bowl, removing the rind and pith but saving the juices. By now the pile of greens will be vastly reduced, enough to serve four to six people as a side dish. 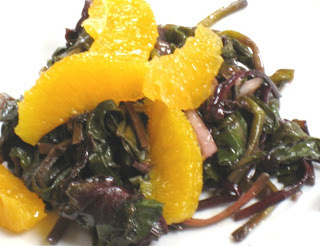 Pile the greens onto plates and garnish with orange sections and a drizzle of orange juice. Fresh beet greens have a hearty, intensely satisfying meaty flavor that is barely reminiscent of beets. There's not much else in the world of greens that can touch them. If you were eating them as a side dish, they'd go perfectly with roast pork. Even better, a gamey piece of venison. In fact, I may be a few weeks behind some of the more ambitious--read organized--gardeners out there. It's time to start seedlings for transplanting after the last frost. I'm embarrassed to say I didn't have a seed starting mix to fill my trays. 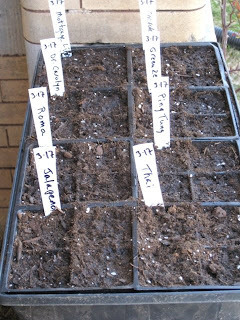 A sterile starting mix is recommended to protect the germinating seeds from any diseases that might be lurking in the soil. I filled my trays with what I had--organic potting mix--and started planting. Each of the labels you see marks a separate four-pack of cells, one seed to a cell. These cells are larger than what I might normally use. 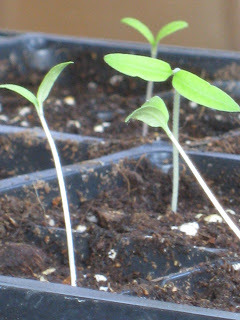 But I've discovered I don't really need 20 tomato seedlings, since I only keep about eight plants. What happens is, the other seedlings get transplanted into larger pots and just grow, and grow, and grow on the front stoop because I don't have room for them in the garden and I can't bring myself to destroy them. Last year I was lucky: I found someone who needed tomato plants at the last minute and he took mine. I'm happy to send tomatoes to a good home. This year in the tomato department I have five varieties: Mortgage Lifter, Cherokee Purple, Green Zebra, Dr. Carolyn and Roma. I'm substituting Mortgage Lifter for Brandywine as our red eating tomato. I wasn't so impressed with the production or the quality our Brandywine plants produced last year. Mortgage Lifter comes with the story of the man who developed the strain and was so successful selling it, he paid off his mortgage. Cherokee Purple is a gangbuster of a tomato. It has a dark blush--not exactly purple--and produces lots of big, juicy fruit. Our plants were particularly long-lasting, making fruit well into the fall. I think I got most of our green tomatoes for pickling from our Cherokee Purple plants. Green Zebra is one of my wife's requests. We haven't grown it before. But she's always impressed with this one when we see it at the farmers market. There's just something exotic and thrilling about a green tomato you can eat like a red one. Dr. Carolyn is a heritage yellow cherry tomato. We had a couple of plants two years ago and they were covered with fruit, even the ones I neglected to cage and that just sprawled on the ground. Roma is the original heritage Italian breed and will be my first attempt at growing canning tomatoes. I had a Roma plant of some sort in the garden last year, but I have no idea where it came from. It was a volunteer and we were able to make a couple of pasta sauces from it. Also in the works is Ping Tung eggplant, the long, skinny variety of eggplant that we like so much. My wife isn't an eggplant fan normally, but she is partial to this one. We also have two chili peppers, jalapeno and Thai. Over the years I've noticed the heat disappearing from the japanos in the grocery store so I decided to plant my own and see if they are any better. We are huge fans of Thai food. One of the problems we encounter buying ingredients such as Thai chilies is that they come pre-packaged in large quantities at the Thai grocery. You can't just buy the few that you need. This way we can pick only as many as the recipe calls for. Now the seed tray goes onto a heated rubber mat made specifically for germinating seeds. Nightshades such as tomatoes, eggplants and peppers like it hot--a soil temperature of around 80 degrees--in order to germinate. Since the temperatures outside are still in the 50s, we will plug in our seed-starting mat somewhere safe inside and fool our seeds into thinking its June. Something inspirational is happening in the garden. 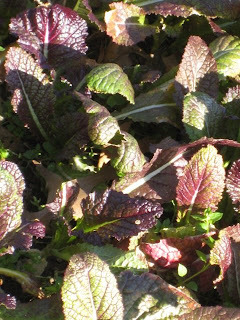 The many greens I like to put in my salads have shaken off their winter stupor and our bounding back into a new season. As they revive, we begin picking again, putting a healthy assortment of greens on the dinner table. Mustard greens are great for cooking. 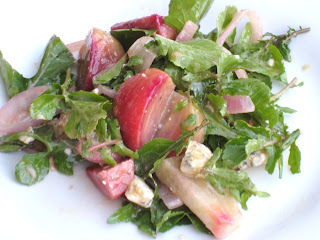 But if the leaves are picked while still young and tender, they make a great addition to a salad. 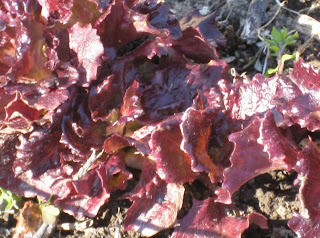 I particularly like this red mustard for the rich color it adds to the salad bowl. You may be getting the idea that I like sharp flavors in my salad. In fact, I love sharp peppery greens even as just an accent in an otherwise mild salad. 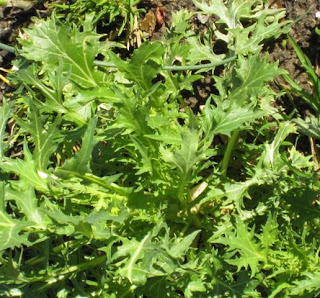 Mizuna is one of my favorites. Its frilly foliage looks great in the garden as well. I never seem to have enough arugula seed on hand. I don't ever want to be without arugula. It has a robust, spicy flavor and a great chew. Sometimes I just dress it with a little lemon and extra-virgin olive oil and eat it all on its own. We even have some lettuces making a comeback. This "Red Summer Crisp," one of about 15 different lettuce varieties I planted last year, seems to be particularly determined to carry on. Before long, though, it's bound to go to seed. 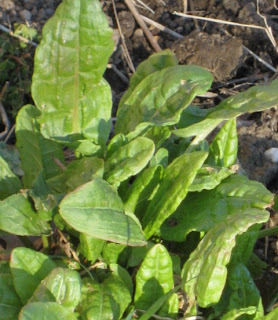 Sorrel is a perennial. It loves these cool, early spring days. Its citrusy flavor is great in a sauce for fish, blended into a pesto or just torn up for a salad. Kids love to pick it right out of the garden. Cilantro doesn't last long in the heat here in the District of Columbia. This plant came through the winter in grand shape. The flavor is the best I've ever tasted. I'm beginning to think overwintering cilantro should be a permanent part of our garden plan. Parsley is a biennial, meaning it goes to seed in the second year. Already it is taking on a woolly appearance. 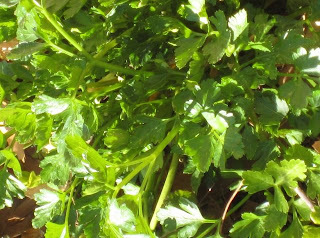 It won't matter how furiously you harvest it--this parsley is determined to replicate. It's almost better just to dig it up and plant some new seed. The sturgeon have been driven almost to extinction. The great cod fisheries are a memory. Bluefin tuna are on the verge of collapse. Is it now the turn of Pacific salmon? Fisheries managers from California to Washington State are talking about halting the catch of Pacific salmon--chinook, coho, pinks--because so few are showing up to spawn in local rivers and streams. The proposed ban--including sport fishing--would be a first. "The situation is unprecedented and off the charts," said Donald McIsaac, executive director of the Pacific Fishery Management Council. Why the salmon have disappeared is still a mystery. Researchers have 46 potential factors to investigate, everything from disease, hatchery problems and an increase in predators to changes in ocean conditions and environmental problems in local waters. Wanna bet humans have something to do with it? Sure you want to feed that milk to your kid? A largely unpublicized but scary bit of sampling found all kinds of toxins in milk. The data apparently has just been sitting at the U.S. Department of Agriculture since 2004. --Ninety-six percent of samples contained DDE, "a breakdown product of DDT, which was banned from agricultural use in the early 1970s. DDT is very persistent and remains to this day in many cropland soils; its soil half-life (time required for 50 percent to dissipate) is generally between 15 and 30 years, depending on soil and climatic properties." --Nearly 99 percent contained diphenylamine (DPA), a "'high volume' industrial chemical used for many purposes in manufacturing rubber and plastic parts, and in making certain drugs." --Forty-one percent of samples contained dieldrin, a "long-banned" organochlorine pesticide. --Endosulfan sulfate, an endocrine disrupter, turned up in 18 percent of samples. --About a quarter of samples delivered synthetic pyrethroid insecticides. --Nearly 9 percent of samples contained a lovely-sounding chemical called 3-hydroxycarbofuran, a "highly-toxic breakdown product of the carbamate insecticide." 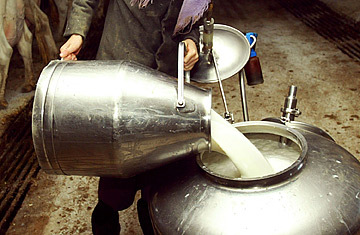 Some of the toxins showed up in samples of organic milk as well as conventional milk. Says the Organic Center: The fact that over one-quarter of the conventional milk samples tested in 2004 contained endosulfan or a carbofuran metabolite is deeply worrisome, given that these chemicals are among the pesticides found in numerous toxicological studies to pose serious developmental risks during pregnancy and to infants and children as their bodies grow and mature. Should organic dairy farmers just make cheese? Organic dairies--especially small, truly organic dairies--are finding themselves increasingly squeezed in the current era of rapidly escalating costs. They say that big end-market producers such as Stonyfield Farms--maker of the national yogurt brand largely owned by Danone--aren't doing enough to pass along profits. Some organic dairymen are switching back to making conventional milk. Read the debate at Grist. Biofuels are supposed to be good for the environment, right? More and more, pollution from biofuel manufacturers is showing up in the nation's waterways, killing fish and fowl. Repeated spills from a major biodiesel plant into a river in Alabama were found to contain pollution levels 450 times the legal limit. In the summer of 2006, a Cargill biodiesel plant in Iowa improperly disposed of 135,000 gallons of liquid oil and grease, which ran into a stream killing hundreds of fish. More recently, a tanker truck was spotted in Missouri dumping a whole load of glycerin--a biofuel byproduct--into a drainage channel. A Missouri businessman has been indicted in the discharge, which killed at least 25,000 fish and wiped out the population of fat pocketbook mussels, an endangered species. We've been reporting lots lately on how food prices and the environment both are taking it on the chin from globalizing diets and the push to turn commodity crops into fuel for automobiles. Now Britain's top scientist says the world is heading for a food crisis, and that cutting down rain forests to plant crops for biofuels is just "stupid." John Beddington recently told a sustainability conference, "There is progress on climate change. But out there is another major problem. It is very hard to imagine how we can see a world growing enough crops to produce renewable energy and at the same time meet the enormous increase in the demand for food which is quite properly going to happen as we alleviate poverty." Beddington predicted continuing price rises in staples such as rice, maize and wheat would continue because of increased demand caused by population growth and increasing wealth in developing nations. He delivered a sharp critique of the trend toward biofuels, which are helping to jack up the price of food globally. "Some of the biofuels are hopeless," Beddington said. "The idea that you cut down rainforest to actually grow biofuels seems profoundly stupid." We know the U.S. Department of Agriculture has been complicit in the worst of this country's agriculture practices. We know the USDA has been schizophrenic on the matter of advocating healthy diets while subsidizing the production of unhealthy foods. But we did not figure the USDA as a bully. Black farmers, after claiming they had been systematically denied loans, subsidies and other benefits by the USDA, won a court settlement worth billions of dollars. Many of those farmers did not get their due, however, because they failed to submit timely claims. Congress, along with Democratic presidential candidate Barack Obama, has stepped in, pressuring the USDA to give the farmers a break. Recently, auditors from the Government Accountability Office showed up at the agriculture department's office to check on progress in the settlement. What did the USDA do? They kicked the auditors out. Apparently, the bouncers at USDA have been beefing up on some of the genetically modified corn the government is promoting. Further relief for the farmers is contained in the Senate's version of the farm bill. So apparently the message is, Don't hold your breath. Finally, it appears we are not the only ones who love to hate Monsanto. The French have made a film detailing all the chemical--er, I mean seed--er, I mean hormone--giant's sins. Can't wait for the U.S. release. Will it be dubbed, or subtitled, I wonder. Particularly fascinating is how Monsanto has succeeded in playing the revolving doors to Washington power brokering. Over the years, the corporation that would hold the keys to the world's food production has managed to place it's people--or people sympathetic to Monsanto--in the highest echelons of government decision making. Remember Donald Rumsfeld? You can read all the particulars in the Greenpeace take here. This particular accidental soup begins by cooking some greens in a pot of water and then forgetting about them or just letting them cook longer than you originally intended. In fact, I had turned the heat pretty low. But nothing gets past my wife, the professional chef. She took note of how long the greens had been cooking, how all the nutrients had been leached out of the greens into the cooking water, and relayed this information to me in the way that spouses sometimes do. I explained that I had purposely turned the heat down so the greens wouldn't overcook, to which my wife replied that the cooking had been going on for at least an hour--she knew precisely, because we had just finished our weekly yoga session, which is an hour long. Just as this discussion was gathering momentum, a small voice was heard to suggest using the water in which the greens had been cooking as a soup base. This would be our friend and yoga instructor Beth, who happened to be sitting at the kitchen island sipping a cup of coffee and listening in. As friends sometimes do, Beth was trying to rescue the situation. It had not occurred to me to use the cooking water for soup. I grabbed a spoon and tasted. Brilliant! Flash forward to that evening. Dinner time approaches. I am seated at the kitchen table with our dog-eared copy of The Moosewood Cookbook, reacquainting myself with the recipe for one of our favorite dishes from that classic volume, "Gypsy Soup." We had flashed on this particular soup because it contains a quantity of sweet potatoes, and we had received a number of sweet potatoes in our weekly CSA box. Sweet potatoes plus my (overcooked) greens, also from the CSA box, plus the aforementioned cooking water sounded like an amended version of Gypsy Soup. I was literally ready to start chopping onions when I noticed my wife heating up the stock pot to cook an artichoke for our daughter--that being the stock pot in which I had been saving my soup base. "Where's the soup base?" I inquire. My wife gives me stricken look. "Oh," she says. "You threw out my soup base?" Well, I thought that might be the end of our Accidental Gypsy Soup, what with the soup base having gone down the kitchen drain. But I adjusted. The Moosewood Cookbook suggested using stock or water in this soup. So I just used water--filtered water. It came out fine, using our CSA sweet potatoes and a few other things from the crisper drawer and the pantry. What makes this soup are the spices and herbs: lots of paprika, turmeric, cinnamon, dried basil. Heat 3 tablespoons extra-virgin olive oil in the bottom of a heavy pot or Dutch oven and add a large onion, diced medium, three medium carrots, peeled and diced, 1 large sweet potato, peeled and diced medium, and three garlic cloves, chopped fine. Cook for about 5 minutes, or until the onions begin to soften. Add 2 teaspoons paprika, 1 teaspoon turmeric, 1 teaspoon dried basil, a dash of cinnamon, a pinch of cayenne and a bay leaf and cook a few minutes longer. 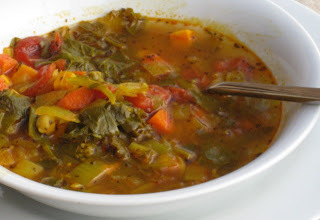 Stir into the pot 1 1/2 cups cooked greens (such as kale, collards, Chinese greens) roughly chopped, 1 14-ounce can diced tomatoes, drained, and 1 14-ounce can chickpeas, or 1 1/2 cups cooked chickpeas. Cover with enough stock or water to make the soup the consistency you prefer. We like ours on the thick side. Bring the pot to a boil, then reduce heat and simmer until the vegetables are all cooked through, about 10 minutes. To serve, season the soup with about 1 tablespoon tamari and ladle into warm bowls. A thick slice of crusty, whole-grain bread would be excellent with this. Kids have been conditioned to expect things sweet. And smooth. And perfectly homogenized. This is a cultural phenomenon especially prevelant here in the United States where families simply do not make much food from scratch at home any more. Whole ingredients have become a rarity in favor of processed foods out of boxes. Consequently I had a tough sell this week trying to entice the kids in my "food appreciation" classes with a delicious, nutritious helping of the yogurt they made last week and a topping of homemade granola. Their first issue was the yogurt that came out of the quart jars I'd stashed in the refrigerator since we first incubated it a week ago. They couldn't get over the globbiness of it, and the bit of whey running off to the side as I scooped the yogurt into a bowl. I had each of them take a small sample with a spoon. Never have so many young faces been screwed up into scowls as they tentatively tasted and recorded the mild sourness. We then sampled some agave syrup. My wife had suggested it as a stand-in for honey, which brings a distinctively assertive sweetness to things. The agave is a cactus-like plant used in Mexico for making tequila. It also makes a fine sweetener--somewhere between honey and a light maple syrup. The kids liked it, and voted to put some of it in the yogurt, which suddenly became palatable for them as it turned sweeter and was stirred into a silken smoothness. 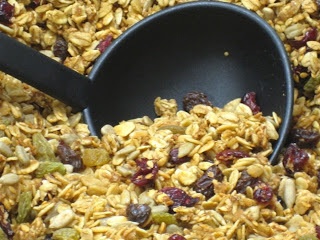 As for the granola, they had great fun measuring out the ingredients and taking turns stirring everything together. This is a basic granola from whole grains and seeds--no nuts--seasoned with cinnamon, nutmeg and vanilla and moderately sweetened with agave syrup. I thought the kids would love it. Boy was I wrong. Their reactions were all over the map. Some indicated they had eaten granola out of a box at home. Others were familiar with granola bars. Many of the kids voted to skip the granola entirely and just eat the yogurt. Then there were a couple who passed on the yogurt and asked for granola by itself. As for me, a bowl of fresh, plain yogurt mixed with warm granola out of the oven proved irresistible. So make both, and if the kids refuse, eat it yourself. Toast coconut on a baking sheet in the oven until lightly browned. 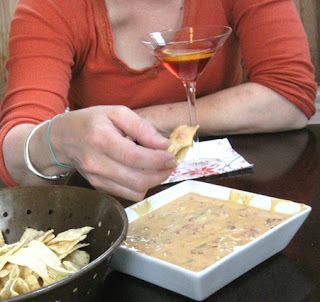 Pour into a mixing bowl. Add remaining dry ingredients, oats, wheat germ, sunflower seeds, sesame seeds (or flax), salt, cinnamon, nutmeg. Stir until thoroughly mixed. Pour agave syrup (or honey), water, canola oil and vanilla into a measuring cup. Use a small whisk to mix well. Pour into dry ingredients and mix thoroughly. Use a spatula to spread the mix onto the baking sheet. Place in the oven and bake, stirring every 15 minutes, until the mix has dried, browned and become very aromatic, about 45 minutes total. Set on wire racks to cool. Pour mix into a clean mixing bowl and toss in dried fruits. When the granola has cooled, it is ready to eat (or maybe you like yours warm?) Serve as you like, with fresh fruit and yogurt, or maybe a little milk. The rest can be stored in sealable bags or jars. Warning: you will be tempted to snack on this shamelessly before you can ever put it away. Note: We did not include nuts in this recipe because of possible allergies. But you certainly may put nuts in your granola if you like.